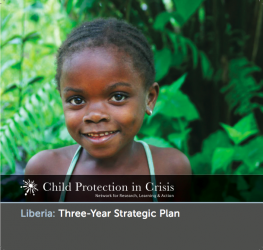 This is the three-year strategic plan for the Child Protection in Crisis Learning Network in Liberia (2012-2015). Their priority areas are mapping of community-based child protection mechanisms and human capacity development. The Program Learning Group (PLG) in Liberia was established in January 2011. The CPC Network’s PLG in Liberia exists to create a safer and improved environment for children in Liberia by influencing the formulation and implementation of policies based on evidence- based research; promoting stronger collaboration of child protection actors to create synergies and complementarities; and institutionalizing child protection as a profession.